Home/Away Assist: Nest automatically turns itself down when nobody's home to help you save energy. Remote Control: Connect your thermostat to Wi-Fi to control the temperature from your phone, tablet or laptop. Farsight: When the Nest Thermostat spots you across the room, it lights up beautifully to show you the time, temperature or weather. Energy Star: First thermostat to earn Energy Star. Your thermostat controls half your energy bill - more than appliances, more than electronics. Saving energy starts with your Thermostat. Nest Leaf: You'll see the Leaf when you choose a temperature that saves energy. It guides you in the right direction. The Nest Learning Thermostat is here to help make your home work for you. Using smart learning technology, the Nest Learning Thermostat can learn what you like and automatically adjust itself to your comfort level. After a couple of days of manual adjustments, the Nest Learning Thermostat can anticipate when you would want to turn the temperature up, to help keep you cozy in the morning, and set the temperature down as you head to bed. The Thermostat also works in combination with your Nest Cellphone App. Remotely change the temperature so that your house can be warm when you come home or, turn the temperature down to save energy while you're away. 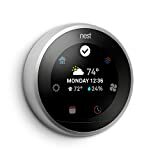 The Nest Thermostat is just one part of your heating and cooling system. But it can keep an eye on the rest of it. You’ll get an alert on your phone if there’s something wrong – like temperatures are so low your pipes could burst. And if it looks like your furnace is acting up, the Nest Thermostat will send you an alert. Nest is focused on making simple, human, delightful things. That’s how we’re creating the thoughtful home: A home that takes care of the people inside it and the world around it.